Paneer dishes are everyone's favorite likewise this paneer soup will also becomes one of your favorite soups. It tastes great with small chunks of paneer and ginger. This is so simple to make with limited ingredients. This is actually clear soup which has to be served piping hot. 1. Heat oil in the vessel , then add the grated ginger. 2. The flavor of the ginger will infused in the oil now. 3. Add the paneer and saute for few seconds. Now add the water and when it comes to boil. 4. Add the cornflour paste mixed with water . 5. Stir it occasionally when the soup thickens add salt, pepper, spring onion and coriander. 6. Switch off the flame immediately and serve piping hot with some pappad as plain or masala. 7. 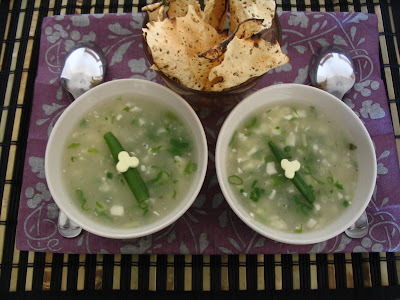 The paneer and flavor of ginger, spring onion and coriander makes the soup delicious. 1. Paneer can be substituted by small florets of broccoli or even corn kernels. Tastes so good. 2. Vinegar is optional if you really like the flavor add while serving. 3. Adjust the cornflour according to the thickness. wow!! I love paneer..this is a superb idea! 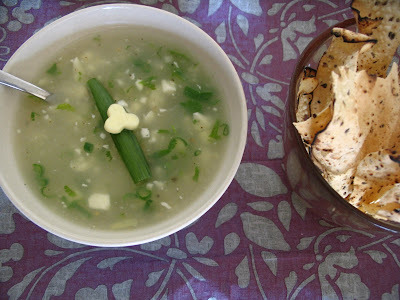 Rich n creamy paneer soup! Wow I have never tried with paneer..this is a great idea! I love panner. In soup, its new to me. Looks tempting. Looks yummy. did you make your own paneer? this looks so tasty. Wow, its really an innovative dish! Great way to eat panner. It looks very tasty. I luv the Mickey face on the garnish. Great! Just happened to visit your blog.. Awesome is the only word . what is most appreciatable is apart from the main dish the aesthetic designs of yours in the side are really cool ..
keep it up!! great job going !! If we have some one like you at home Why would anyone need to go to restaurants. This is new to me... Looks gr8! Delicious! never tried soup with paneer. clear soup is great any time. curious about the taste factor though! seems interesting. beautiful click. Thanks everyone for ur lovely and encouraging comments. this one sounds so good.. looks very clear like a chinese soup. nice recipe pavithra. the sticks on top look very cute.. 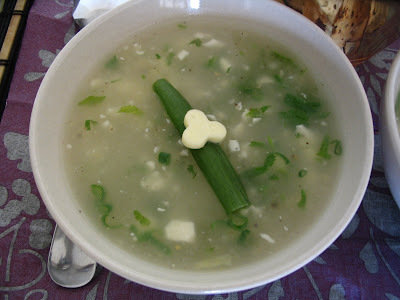 Delicious soup dear..love the color and presentation..how did u create that cute little thing on top?